Dragons Lair Crystal Ball Fantasy Sword With Display Plaque | BUDK.com - Knives & Swords At The Lowest Prices! You"ve never seen a fantasy display sword with as much detail and character as our Dragon"s Lair Crystal Ball fantasy sword. The stainless steel blade has fantasy cut-out design spanning the center of the blade and intricate dragon designs on each side. 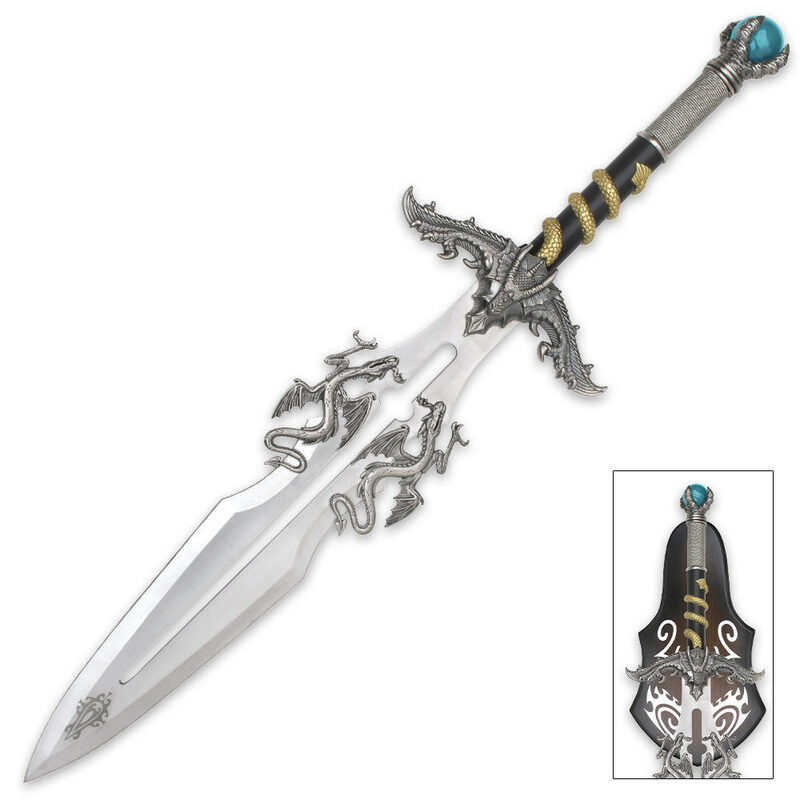 The ornately designed hilt and handle feature dragon wings and golden-colored dragon scales. The metal fittings, wire wrappings and intricate accents give this fantasy sword tons of flair. The dragon claw shaped pommel has a blue imitation crystal ball for even more elegance. From the stylish orb on to the tip of the blade, it measures 25" overall. Display it boldly on the included wooden wall mount display. I bought this sword for display purposes,but quickly found out its not just a beautiful display piece. But its also well made of metal throughout the whole thing. I sharpened the sides and from its solidness its battle ready if need be. Sorta makes u feel like HE-MAN when you're holding it. I have been looking at BUDK's catalogs for a while now and have bought a few things, but I have to say that this sword is my crowning glory so far. I just love it. thanks BUDK. A VERY SATISFIED CUSTOMER. Great detail and very good at grabing the attention of all my guest. Blade was slightly loose, along with the twin dragons being a one-faced design. Otherwise I was satisfied with this purchase. This sword is amazing. I love everything about it. Other than the orb being slightly darker than I'd expected. Its perfect.